Simple but elegant and classic, the cannon handle of the knife is topped with a finial that echoes the tip. 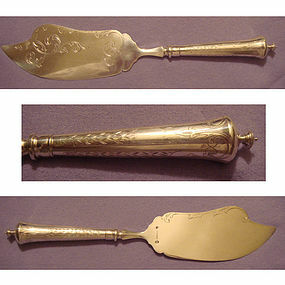 The handle is engraved with what appear to be a sort of diapering of dart-and-egg motifs along the shaft, with a border of acanthus. The blade is also classic, with engraved foliage relieving the otherwise plain surfact. The knife is marked with V Christesen --for Vilhelm Christesen whom, in 1846, opened a large factory in Copenhagen -- the mark of Simon Groth, the Danish assay warden from 1863-1904, and the Copenhagen 3-tower mark for 1876, guaranteeing the minimum fineness of 826 fine (82.6%) silver. Overall condition is very good, but there is a small prick in the handle which is difficult to see; otherwise, there are no burrs, pits, dents or scratches. Length is 12-1/4 in. with the finial, and weight is 150 g.